Over 750 young people and leaders came together for Life 2 the Max 2018 which took place on Saturday 23rd June at Felden Lodge. The event is run by London District, but also welcomed young people and Leaders from outside the District with participants from Birmingham, Bedford, Mid Suffolk, Bletchley and Chiltern. 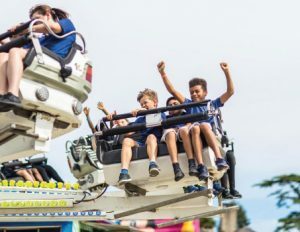 It was a fantastic day with a range of rides including the massively popular Dodgems and King Frog along with activities, workshops and shows for all age groups. Ben Jack from the Message Trust concluded a brilliant day with a powerful message about living life to the full through a relationship with Jesus. Life 2 the Max takes place next year on Saturday 22nd June 2019 at Felden Lodge and there is an open invitation to all Companies. Check out www.thebbinlondon.org.uk for more details.